We often are asked why Roadware 10 Minute Concrete Mender™ outperforms so many epoxies, poylureas, and cementious concrete repairs. To find out why Roadware 10 Minute Concrete Mender™ works, we contacted Prof. David A. Lange, Department of Civil Engineering, University of Illinois at Urbana-Champaign. Dr. Lange used scanning electron microscopy to determine how Concrete Mender penetrates concrete surfaces and becomes part of the concrete. Concrete Mender is a 2-part polymeric repair material used for repair of spalled or cracked concrete pavements and structures. The microstructure of bond, the rheology of the fluid material, the shrinkage of the material during the first week, and the elastic modulus of the cured material are key aspects of Concrete Mender‘s successful field performance. The purpose of this study is to provide insight into the fundamental material-level behavior of Concrete Mender. This study addresses several aspects of the material behavior of Concrete Mender that are essential elements of its superior field performance. Bond of repair materials is one of the most important issues in achieving long term performance in repair of concrete. It is well known that repair materials achieve their primary bond through mechanical interlock with the microstructure of the substrate. It is important that a repair material can penetrate and mechanically engage with the pore structure of the concrete. This study used scanning electron microscopy to investigate the interface between Concrete Mender and the concrete substrate. A second issue is ease of application. A repair material must have attractive workability and flow in order to successfully consolidate against the concrete substrate. The ease of application in the case of Concrete Mender is largely a function of its viscosity. Rapid set is another aspect of application, and this is observed through a rapid increase in viscosity. This study measured the viscosity of Concrete Mender as a function of time to provide an understanding of how the fluid Concrete Mender interacts with the substrate within the first few minutes of contact. Shrinkage of repair materials should be minimized so that high stresses do not form to debond the interface with the concrete substrate. The potential for shrinkage stresses are commonly evaluated by free shrinkage tests, although in practice it is important to realize that creep relaxation is an important mechanism for reducing the level of stress in the repair. The free shrinkage of Concrete Mender during the first week was measured. Last, it is important to understand the stiffness of the repair material. Polymeric repair materials usually have a Modulus of Elasticity that is lower than that of the concrete substrate. This generally has a positive influence on durability because it means that the repair is relatively flexible and resistant to brittle fracture and debonding. A low Modulus of Elasticity also implies that the repair will not highly restrain the substrate and thus create local regions of high stress. Four experiments were conducted in this study. These experiments and results are discussed in the following sections. The concrete beam was fractured and the two fracture surfaces were aligned with a 1/8″ gap between. Concrete Mender was used to fill the 1/8″ gap between the two faces of the fracture, using the manufacturer’s instructions. Sand provided by Roadware was used to fill the repair. After the Concrete Mender was fully cured, the specimen was sawed to isolate small samples of interface between the Concrete Mender and concrete. The small samples (approximately 10 x 10 x 10 mm) were potted, ground, and polished for investigation by electron microscopy. The samples were positioned so that all observations were nominally perpendicular to the original fracture surface. 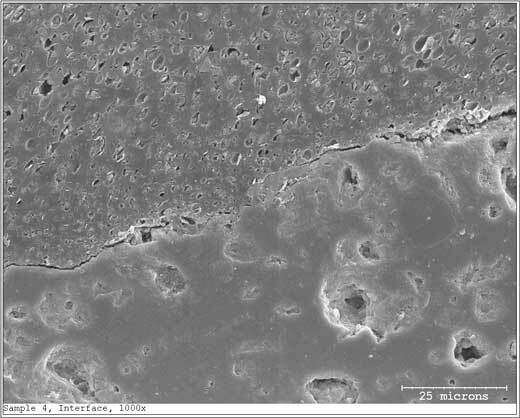 About 30 micrographs were acquired from four different samples and saved in high-resolution digital TIFF files. 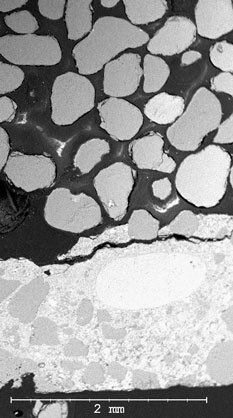 The micrographs revealed a well-bonded interface and significant penetration of the Concrete Mender into the fine pore structure of the cement paste. Figure 1 shows the interface between the Concrete Mender (with sand aggregate) on the top half of the image and the concrete substrate on the lower half of the image from Sample 4. The interface between Concrete Mender and concrete is an intimate bond, and it is clear that the Concrete Mender has penetrated into the cement paste. Annotations on Figure 1 indicate the depth of penetration. The region of penetration is identifiable by observation of the texture of the surface. The impregnated region has a smoother, filled-in appearance, and the urethane provides integrity to the microstructure during polishing. Regions without urethane impregnation have a more abraded, rougher texture with more plucked-out grains due to the grinding/polishing process. Figure 2 is an image of the interface of Sample 1 indicating that Concrete Mender fully penetrated small fissures near the interface. 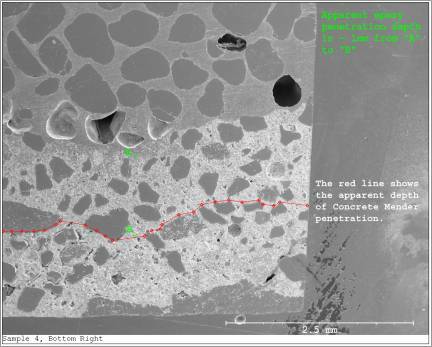 Figure 3 is another image from Sample 4, also annotated to indicate penetration of the Concrete Mender. Figures 4 and 5 are high magnification images (1000X) taken from Sample 4. Both figures show the same region of the sample, but Figure 4 is a back-scattered electron (BSE) image and Figure 5 is a secondary electron (SE) image. In the BSE image, the grey tones reflect the relative atomic weight of the materials. The urethane, principally a hydrocarbon, is relatively dark material compared to the concrete material, which is dominated by compounds with calcium and silica. The light-toned specks in the Concrete Mender are likely to be super-fine aggregates introduced during the fabrication of the specimen. A network of fine, non-connected porosity characterizes the Concrete Mender. These small pores (less than 5 micron in diameter) may be small bubbles that persist from the mixing process or are created during curing of the urethane. The dense, smooth texture of the concrete substrate again indicates the presence of urethane in the cement paste pore structure. Some larger voids seen in the concrete substrate may from plucked-out grains or voids that were not filled with the urethane. It is reasonable that some larger voids are not filled when the urethane is drawn into the pore structure by capillary forces. Principles of physics tell us that smaller capillary pores exert greater capillary force and larger voids exert less capillary force. Thus, it is not unusual to observe large open voids within regions that exhibit general penetration of the finer pore structure. In other words, the urethane feels a greater pull from the fine pores of the cement paste (1 µm or smaller) than from larger (25 µm or bigger) air voids in the cement paste. A Brookfield Viscometer was used to measure the viscosity of Concrete Mender as a function of time. The rotary viscometer was used with two cylindrical spindles with differing diameter. The larger LV-1 spindle at 60 RPM was used to measure the viscosity range of 0-50 cP, and the smaller LV-4 spindle at 60 RPM was used to measure the viscosity range of 50-5000 cP. Data from two test runs (one with the small spindle and one with the large spindle) were merged to give the results presented here. The Concrete Mender was mixed using the standard applicator and placed into a glass beaker. The first reading of the viscosity of the mixed Concrete Mender was at 30 seconds after ejection from the applicator. Figure 6 illustrates the viscosity vs. time relationship. In the first two minutes, the Concrete Mender has a low viscosity of about 10 cP. The lowest viscosity measured was 8.6 cP. After about three minutes, the polymerization process begins to accelerate, and the viscosity of the urethane mixture rises sharply. Viscosity is related to the ease with which individual molecules of the liquid can move with respect to each other. It depends on the attractive forces between molecules, and on whether there are structural features that cause the molecules to become entangled. As the urethane mixture polymerizes, the chain molecules become longer, and have greater entanglement. Ultimately, the urethane properties evolve to that of a solid material that exhibits structural integrity and elastic solid behavior. Concrete Mender achieves solid-like behavior in about 10 minutes. The relationship of viscosity with time is one way of understanding the evolution of Concrete Mender from a liquid to a solid. As a liquid with a viscosity of only 10 cP, it can wet the concrete surface and be drawn into the concrete pore structure by capillary forces. The penetration of Concrete Mender into the pore structure would cease after perhaps three minutes when the viscosity of the urethane mixture rises to 1000 cP. For this reason, the best results with Concrete Mender are achieved when applied using the manufacturer’s recommended procedure which uses a “static mixing nozzle” that allows the urethane to be applied to the concrete immediately after mixing. Other procedures that allow time to elapse between mixing and application will compromise the short time window of low viscosity. Concrete Mender easily wetted the surface of the concrete substrate. Qualitatively, this observation indicates that Concrete Mender has a relatively low surface tension with respect to the solid surfaces in concrete. Surface tension is the force at the surface of a liquid due to adhesive forces of the liquid molecules for the solid walls of a container and the attractive forces of the molecules of liquid for each other. When the adhesive forces of the molecules for the solid walls of the container are greater than the attractive forces between the liquid molecules, then the liquid will wet the solid surface. In the case of porous solid such as cement paste, the liquid will wet the exposed surfaces and will be drawn into the pore structure under forces known as capillary tension. The extent of penetration of a liquid into pore structure is governed by the strength of capillary tension forces and the liquid viscosity. In the case of Concrete Mender, this balance is favorable, and significant penetration of the urethane mixture occurs within minutes of contact. A free shrinkage test was conducted on a sample of Concrete Mender from about 15 minutes after mixing until 7 days of age. The sample was neat Concrete Mender with no added sand. The sample was a 1″ x 1″ x 11″ prism with two metal contact points embedded at the ends. Figure 7 illustrates the length change with time. Assuming that the coefficient of thermal expansion, Ct = 1.0 X10-4in/in/°F (a textbook value for similar urethane material), the initial hour of measurement is dominated by thermal contraction when the temperature dropped from an estimated 110°F to 75°F. Subsequent shrinkage from 1 hour to 7 days represents inherent shrinkage that characterizes these kinds of polymers during their extended curing process. Concrete Mender has shrinkage of only 0.1% between 1 hour and 7 days, and a low shrinkage of only 0.05% between 2 hours and 7 days. An ICRI Guideline  suggests that a shrinkage of 0.05% is “low” , indicating that Concrete Mender will tend not to generate shear stresses that cause debonding of a repair material. Note that this test of Concrete Mender was performed on a neat sample with no sand added. When sand is added, the overall shrinkage of the sand-Mender mixture will be proportionately reduced. For example, a sample of Concrete Mender with 50 vol% sand would have about 50% of the shrinkage of the neat urethane. Mechanical properties of two fully cured samples of Concrete Mender were measured. The first sample made of neat Concrete Mender and the second sample was a Mender:sand blend where the sand volume fraction was 54 vol%. The sand had a specific gravity of 2.65 and Modulus of Elasticity of 94 GPa. The samples were 1.0″ x 1.0″ x 11.2″ prisms. where EC is the Modulus of Elasticity of the composite, V1 and V2 are the volume fractions of the two phases, and E1 and E2 are the moduli of the two phases. With Concrete Mender being one phase (V1 = 0.46; E1 = 0.944 GPa) and silica sand being the second phase (V2 = 0.54; E2 = 94 GPa), the series model predicts a composite modulus of 2.0 GPa, somewhat lower than the 5.1 GPa as measured from the test results. Since the series model is an idealized condition that assumes no bond between the phases, the observed difference between the prediction and actual modulus is related to the presence of bond between Concrete Mender and the silica sand grains. The main point of this analysis is simply to understand the origin of the mechanical properties, and understand how Concrete Mender with sand can be considerably stiffer than the neat Concrete Mender. Normal strength concrete has a Modulus of Elasticity of 25-35 GPa. Concrete Mender with or without sand will always be much less stiff than the concrete. Therefore, when under load, the Concrete Mender will deform more than the adjacent concrete. One concern about the combined behavior of two materials with vastly different moduli is that shear stresses can develop and debonding can occur. However, in practice, Concrete Mender is used for very thin repair and crack filling. These scenarios are often accompanied by multiple load paths that would mitigate potential for general debonding of the repaired section. Since Concrete Mender has strength on the order of the underlying concrete, and the interaction of the fresh urethane mixture with concrete microstructure facilitates high quality bond, thin repairs with Concrete Mender will usually exhibit high strength and stiffness. Therefore, it is generally possible to achieve a “structural” repair of cracks to restore the mechanical performance of the original concrete. The microstructure of the interface between Concrete Mender and concrete substrate indicates that high quality bond is achieved. The success of Concrete Mender is due to the compatibility of Concrete Mender with concrete materials. The fresh liquid has a low viscosity and a low surface tension that allows capillary forces to draw Concrete Mender well into the pore structure of the concrete. In the experiments using a 5500 psi concrete, penetration of 1 mm was measured, indicating that repairs using Concrete Mender fully engage the underlying substrate. The shrinkage of Concrete Mender is low and should not pose concern for debonding or delamination due to volume changes. The Modulus of Elasticity of Concrete Mender, as with almost all polymeric materials, is lower than that of concrete. The strength of Concrete Mender is on the order of normal concretes used in construction. When used for thin repairs and filling of cracks, it is reasonable to expect that repairs with Concrete Mender largely restore the structural performance of the original concrete. 1. International Concrete Repair Institute (ICRI), Guide for Selecting and Specifying Materials for Repair of Concrete Surfaces, ICRI Technical Guideline No. 03733, January 1996.